FAIRFAX, Va. — Geno Auriemma wasn’t sure he’d be able to attend Game 3 of the WNBA Finals on Wednesday, but there he was in the EagleBank Arena stands. He didn’t want to miss this night. The legendary University of Connecticut women’s basketball coach sat next to his long-time assistant Chris Daley watching the most decorated player they’d ever coach do what she always does — dominate and win. 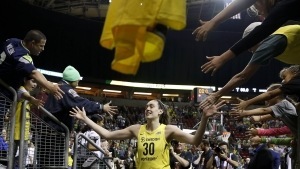 “She’s winner, what else can I say,” Auriemma said, smiling broadly as Breanna Stewart strolled around EagleBank Arena after the Storm’s 98-82 win clutching the WNBA trophy in one hand and the Finals MVP award in the other. “I’ve seen that before,” Auriemma added. Before the Storm selected Stewart with the No. 1 overall pick in the 2016 draft, the 6-4 forward arrived with the incredible hype befitting the only player to win four NCAA tournament titles and four Most Outstanding Player of the Final Four awards. Stewart was expected to lift a once-proud franchise from the doldrums and deliver a championship, but her first two years in the WNBA ended with disappointing first-round playoff exits on teams that were the No. 8 seed. But this year, the Storm’s third-year star fulfilled her promise in spectacular fashion. “This is probably one of the best things that has ever happened to me,” said Stewart, who averaged 25.7 points in the Finals. “The WNBA is the best league in the world and to be so successful so soon, obviously a lot of credit goes to my teammates, the coaching staff and Sue (Bird). Stewart scored and scored and scored in this series, capping her first Finals appearance with 30 points — a career high in the playoffs — eight rebounds, three assists and two steals. To his detriment, Mystics coach Mike Thibault never found a way to slow down Stewart, who connected on 11 of 22 shots, including 4 of 5 three-pointers in a devastating series-clinching performance. The 24-year-old forward is the sixth player to win both MVP awards in the same season joining Cynthia Cooper (who did it twice), Lisa Leslie, Diana Taurasi, Sylvia Fowles and former Storm star Lauren Jackson. This article is written by Percy Allen from Seattle Times and was legally licensed via the Tribune Content Agency through the NewsCred publisher network. Please direct all licensing questions to legal@newscred.com. Next Article California Baptist and North Alabama join DI this year. Here's what you need to know.